Indian Defence Minister Manohar Parrikar paid a landmark visit to the United States at the invitation of the US Secretary of Defense Ashton Carter in the second week of December this year. The highlight of the visit was the four-hour guided tour on the nuclear powered US aircraft carrier USS Dwight D. Eisenhower, given by US Defense Secretary Carter himself and if the bonhomie displayed by the two Defence Ministers during the guided tour was any indication, it can be said easily that the two countries are now geared to long-term strong partnership, which would have global ramifications especially in Asia. This was the first visit of an Indian Defence Minister to the US nuclear-powered carrier. The US side has two-pronged aim behind arming and equipping India with modern weapon systems like the Apache attack helicopters and modern anti-tank and long-range air-to-surface missiles. First, this will help bring new businesses to US defence companies and second, this will advance US strategic interests in the Asia-Pacific region. The US had earlier supplied the long-range maritime surveillance aircraft P-8I, called Poseidon in the US Navy. It was for the first time that this modern maritime and lethal surveillance aircraft in the world has been supplied to any navy outside US. However beyond the traditional weapon systems and platforms, the Pentagon is ready to help India indigenously develop and produce the latest class of weapon systems and platforms. To enable this the Pentagon has for the first time created for any country a special cell for India called the India Rapid Reaction Cell (IRRC) which falls under the purview of the International Cooperation Office of the Under Secretary of Defense for Acquisitions, Technology and Logistics. The IRRC will assist in promoting the initiatives of the DTTI (Defence Technology and Trade Initiative) which is intended to jointly develop and manufacture in India next-generation military technology. The Defence Minister Parrikar was accompanied by a very high level defence industry delegation from India which included the doyens of Indian industries like the L&T, Tata, Reliance, Dynamatic Technologies, Sun Group, etc. The delegation also included the Indian Defence Secretary and Vice Chiefs of the three services besides other senior officials. Both the Defence Ministers took note of the positive progress during the recent meeting of the Joint Working Group on Aircraft Carrier Technology, especially in the area of Aircraft Launch and Recovery. Under this programme Indian engineers will participate in the development of Electromagnetic Launch Systems for the future aircraft carriers on government to government basis under the DTTI. After the talks, the two sides issued a joint statement which also indicated an evolving long-term partnerships which will be a subject of envy for India’s neighbours. 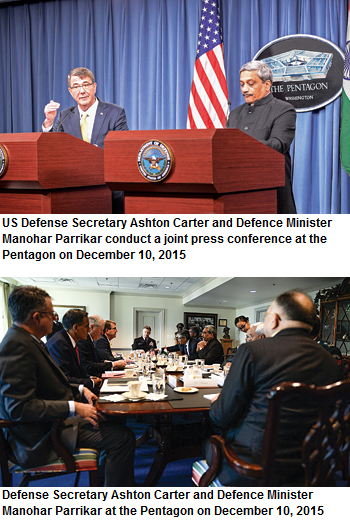 According to the joint statement Manohar ­Parrikar and Secretary Carter discussed the India-US defence relationship and broader India-US strategic partnership and focused on ways to maintain the strong momentum of security and defence engagement, including means to further move the DTTI forward. Both expressed satisfaction with progress achieved under DTTI and committed to identify additional projects for possible co-development and co-production of high technology items that meet the transformational intent of DTTI. Both the Defence Ministers took note of the positive progress during the recent meeting of the Joint Working Group on Aircraft Carrier Technology (ACTC), especially in the area of Aircraft Launch and Recovery (ALRE) and expected the progress to continue during the second meeting of the ACTC to be held in February 2016. The meeting will be held this time in New Delhi. Under this programme, Indian engineers will participate in the development of Electromagnetic Launch Systems (EMALS) for the future aircraft carriers on government to government basis under the DTTI. The two sides also commended the progress achieved in the Jet Engine Technology Joint Working Group, which met in the first week of December in Bengaluru. The meeting resulted in terms of reference and had productive discussions on cooperation in this area. According to sources under this cooperation, Indian and US experts will jointly develop a jet engine for India’s decade-old proposal to develop advanced medium combat aircraft (AMCA). This will be a significant part of the DTTI. It is worth mentioning that India could not finally develop the jet engine Kaveri for the light combat aircraft (LCA) Tejas, even after two decades of effort. India had to ultimately order F-404 engine for the LCA from the United States. Now India’s AMCA project has been designed in a very ambitious manner. Indian planners want to develop an indigenous engine for the AMCA project which may be India’s answer to the fifth-generation fighter. During the meeting Secretary Carter also informed Parrikar that in the light of the strengthening relationships between US and India the US Department of Defense has updated its policy on gas turbine engine technology transfer to India. Due to this policy update the US Defense Secretary expressed the confidence that US will be able to expand cooperation in production and design of jet engine components. The US companies will further work with Indian counterparts to submit transfer requests that will benefit from this updated policy. During the meeting Parrikar also informed Secretary Carter Indian decision to participate in the Rim of the Pacific (RIMPAC) multilateral naval exercises in 2016. India will also participate in multilateral Red Flag exercise in April-May 2016. Both the Ministers also expressed support for greater air-to-air interaction in the coming years. US side also confirmed the participation of the US naval ships in the International Fleet Review being hosted by the Indian Navy in February 2016. Both the Defence Ministers also expressed appreciation for the progress achieved last month at the Defence Policy Group meeting which focused attention on defence capability development for humanitarian assistance and disaster relief. 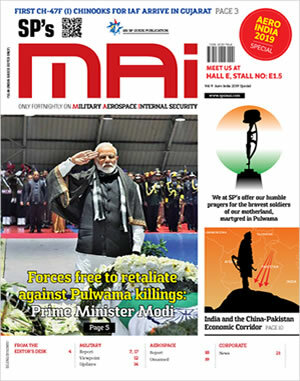 However, according to sources, in spite of lot of goodies to Indian armed forces, Indian side is not convinced about the need to adhere to US defence laws like the LSA, CISMOA and BECA. It has been reported that the US side raised this issue and told Parrikar that adhering to these foundational US laws will easily facilitate transfer of technology and weapon systems without crossing the bureaucratic barriers. US officials contend that of all the LSA is the most easier one and will facilitate easy exchange of goods mid sea in case of emergency. However, due to Indian political sensitivities it would be difficult for the Modi Government to agree to these US laws. The CISMOA (Communication Interoperabiilty and Security Memorandum) and BECA (Basic Exchange and Cooperation agreement for Geospatial Cooperation) are considered to be surrendering to US laws and it would be difficult for the Indian Government to sign on this. According to sources, Parrikar also raised the issue of US supply of defence systems like the F-16 fighter aircrafts and associated weapon systems to Pakistan in the name of fighting terrorism. But the US gave a standard reply that it will not create any imbalance in the region and it is necessary for US to keep Pakistan in good humour. Interestingly the US side is interested in manufacturing the F-16 fighters in India under the ‘Make in India’ programme. On the other hand the US side offered to manufacture F-18 multi-role fighters in India under the ‘Make in India’ programme. Indian political and domestic economic environment has changed so drastically that US companies have been vying among themselves to manufacture their top category weapon systems and platforms in India. Not only this if India moves forward in developing the advanced medium combat aircraft US has decided to assist India in this ambitious venture. The US’ willingness to cooperate with India in jointly developing the next-generation jet engine with Indian experts is very significant.